A friend of mine told me she really loved the fair trade World Changer shirts at Mercy House, but she felt weird buying one–for herself. So, she bought them for her kids. Which is exactly why I told her she should buy one for herself, too. Because when we try to raise our kids different than the world–to love others, to share what we’ve been given–that’s exactly what we are doing. We are changing the world. And we are helping them change theirs. But if we are too scared to proclaim it over our lives, than they might be also. 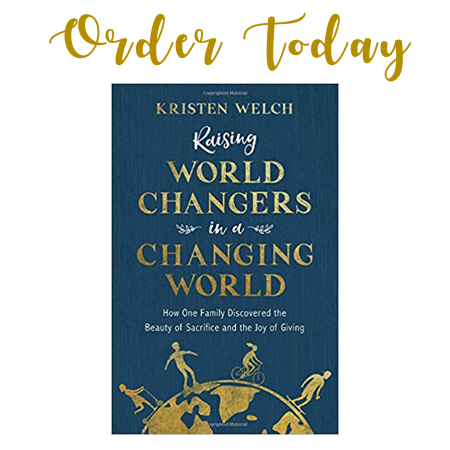 The biggest lie we can believe is that we aren’t good enough or doing enough to even call ourselves a world changer. I’ve been calling myself one even on the days I’ve drug my kids kicking and screaming halfway around the world. See, the thing is, my family is just like yours. Only we are probably more behind on laundry. We fight. We cry. We slam doors. We get it wrong sometimes. And that proclamation to change the world is a constant reminder of what God has called each of us to do. To be. There have been seasons when my kids hated who we were and what God asked us to do. This yes has pushed us out of our comfort zone and made fitting in hard and the status quo unattainable. But God, in his goodness, gives us glimpses of who are kids are becoming and they encourage us to keep going and remind us that we are truly changing their world as much as they are changing theirs. We see it when our son invites the new kid to church. When get a glimpse when our daughter shares her lunch with the friend who forgot hers. 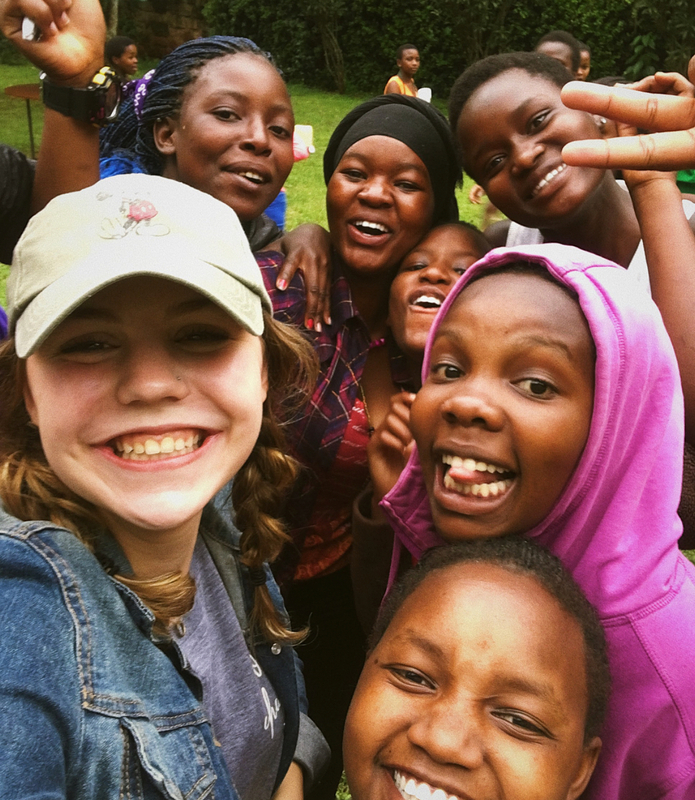 When we see the sheer joy on our teen daughter’s face with her friends in Kenya, we see the face of God and we know that our kids believe it for themselves–that they really are changing the world. Whatever God asks you to do, wherever you go. . . Take your family with you– You won’t regret it. Teach them to love others. Show them how to do it. It won’t only change your life; it will change your family. And I have a one-of-a-kind, super fun opportunity for you to take your family with you . . . to Mercy House. 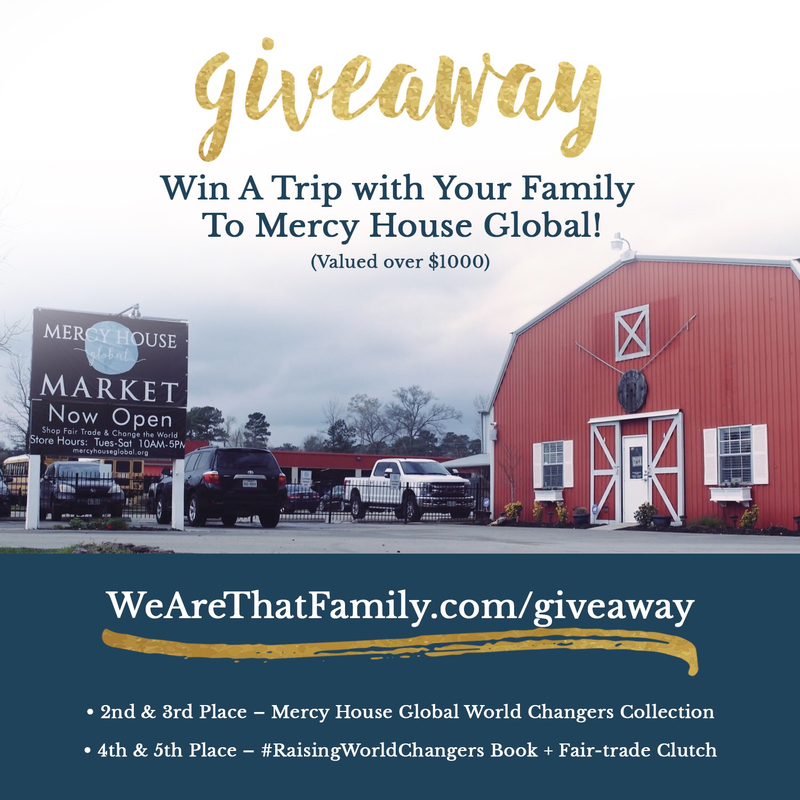 In partnership with my publisher, I have some amazing giveaways and the Grand Prize is a family trip to Mercy House. See details below. Even if I don’t win, which I hope I do, I am overwhelmed by the generosity of this gift. Honestly, I really want to meet little Godwin and his precious mommas!! This would be amazing. I already have the new book pre ordered and I am telling as many people about it as possible. We are preparing to take our own children on missions out of the country in 2019. Getting a chance to talk with people who have does this many times would be amazing! Such a fun giveaway! I’m about an hour away from the barn but I’d definitely take a couple nights in a hotel! How incredibly exciting! What an opportunity this will be for someone!! Wow! What an awesome giveaway! Praying for Mercy House and all those connected with it! Amen to this and something for me to remember when they’re driving me bonkers! Just above the giveaway picture is a box that will allow you to sign in to enter (via Facebook or email). It took a few minutes for that widget thing to show up on my desktop. I guess it was just taking a while to load. Hope you can see it and get the chance to enter! What an amazing opportunity! I see my children changing worlds in our small town with their friends and it never ceases to amaze me how tge simple gestures speak volumes. Yay! Thank you so much for the opportunity!!! I ordered the Mercy tee shirt and you were out in my size and I also felt funny about wearing the World Changer tee shirt. But I wear it and hope that the decisions we have made as a family although not as amazing and “all-in” as yours, will be both world changing and Kingdom focused. We live in Texas and would be there in a heartbeat if we won and would consider it a privilege to meet your family. Of course, just the right person will win. God Bless for all you do!!!!! I’m not sure what the WRC mailing list is (I thought it would take me to a link) but I did tag someone when I shared your FB post 🙂 What great prizes! I have been sending your fair trade surprise boxes to my missions-minded niece lately and she has loved the products and always tells me the “story” on the cards that come with. Ohhh, Please pick me! Thank you so much! I love following Barbara Rainey and a while back she provided a link to your blog on her blog! This would be a trip of a lifetime for my husband & three kiddos. We are a ministry family living in St. Augustine, Florida. I would love for my kids to catch this vision! To God Be the Glory. What an amazing and generous giveaway! How awesome would it be to come to TX with my family to see it all in action and to share with everyone I know the work you are doing. Just published my book review on my blog! I love what you guys are doing for others. At age 9 my son decided he wanted to collect blankets for the homeless. He is 12 now and has collected and distributed close to 3,000 Blankets. He has such a tender heart. Hoping to read your new book soon. Samuel’s Blankets for the Homeless. Also, would love to win the trip!! Eeek! Have you chosen a winner? !